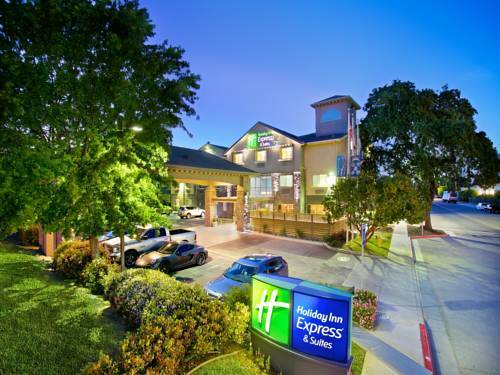 Paso Robles Hotel Located in California Wine Country Our newly renovated Holiday Inn Express and Suites has an ideal location. We are within walking distance to Starbucks several dining choices and less than a mile from historic downtown with shopping and tasting rooms. Minutes from Camp Roberts, Fort Hunter Liggett, San Ardo, Twin Cities Hospital and directly across from the Paso Robles Event Center, home of the California Mid State Fair. Our hotel is perfect for business and leisure travelers alike. Cal Poly, Cuesta College and San Luis Obispo Mission are thirty minutes away. We are close to attractions like Hearst Castle, Vina Robles Amphitheatre, Pismo Beach, Morro Bay, Hunter Ranch Golf Course and Paso Robles Golf Club. Tour BH or Firestone Walker Brewery and enjoy over 200 wineries including Tobin James and Justin. Family activities include The Ravine Waterpark, Children's Museum, Barney Schwartz Park and Estrella Warbird Museum. Explore Mission San Miguel, relax at the River Oaks Hot Springs Spa or enjoy a horse show at Twin Rivers Ranch. Meeting rooms are available if business brings you to the area. Relax in our indoor saltwater pool or burn calories in the Fitness Center. Start each morning with our hot breakfast included in your stay. We offer a midweek complimentary hospitality reception featuring local breweries and wineries for a true taste of Paso! Walmart Shopping CenterIn this shopping center youwill find a Walmart, Khol's, JC Penny's, and a Payless Shoes. Hunter Ranch Golf CourseHunter Ranch is one of the best conditioned, most beautiful 18-hole golf courses in California. Our pristine fairways are lined with century-old oak trees, lakes, and natural grasses. Hunter Ranch is a treat for your game, and for your senses. Paso Robles Country ClubA former country club, they are now under new ownership and open to the public. They are an 18-hole, 6,215 yard, par 71 championship course that provides an inviting golf experience for the low handicapper, as well as the enthusiastic player.